Hello crafters! 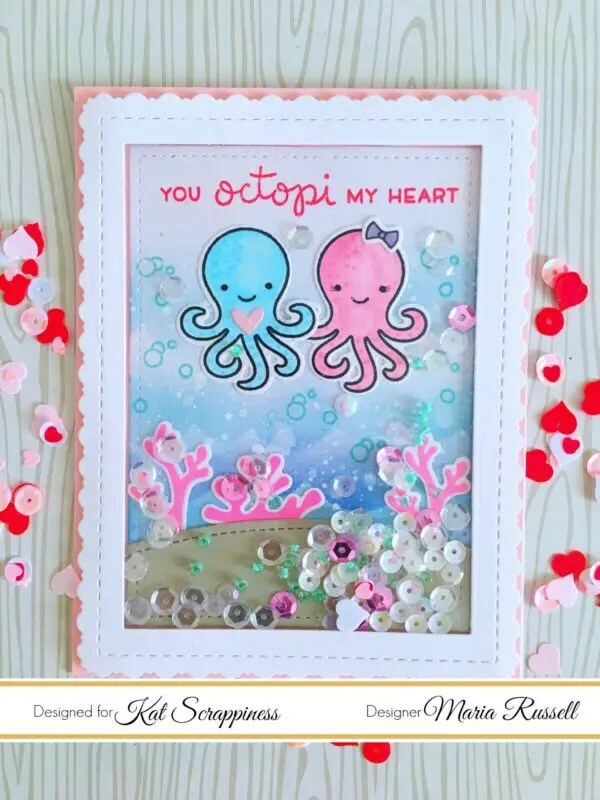 It’s Maria Russell here with you again today to share with you a cute Valentine’s card, showcasing the Stitched Fancy Scalloped Rectangle Dies, Stitched Rectangle Dies, Lawn Fawn Octopi My Heart stamp set and dies, and a LOT of products available now at Kat Scrappiness. 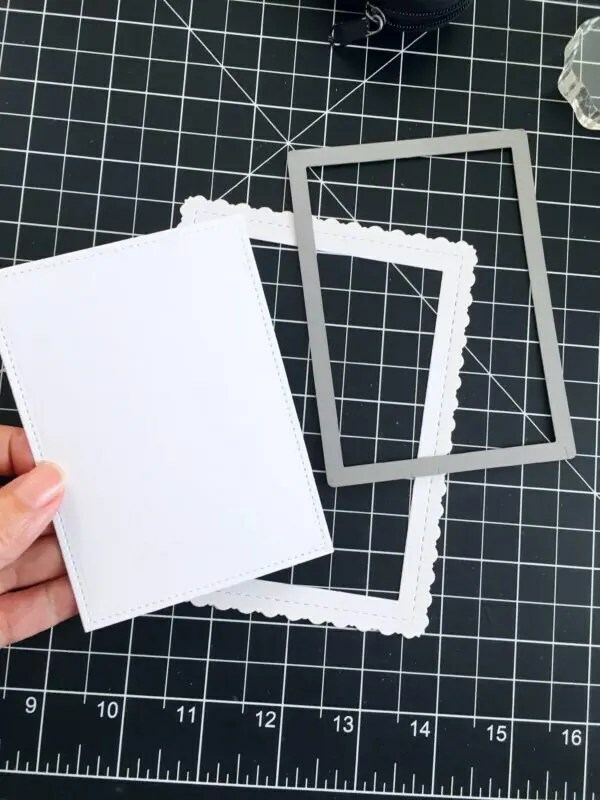 I wanted to record a process video earlier to show you how I made this shaker card but I am still recovering from laryngitis and it was so hard for me to talk and craft at the same time. I apologize if I don’t have a process video for you today. I started out by die-cutting my shaker panel using the new Stitched Fancy Scalloped Rectangle Dies, with the Stitched Rectangle dies. I also used my acetate sheet to adhere to the panel to create the window for my shaker card. 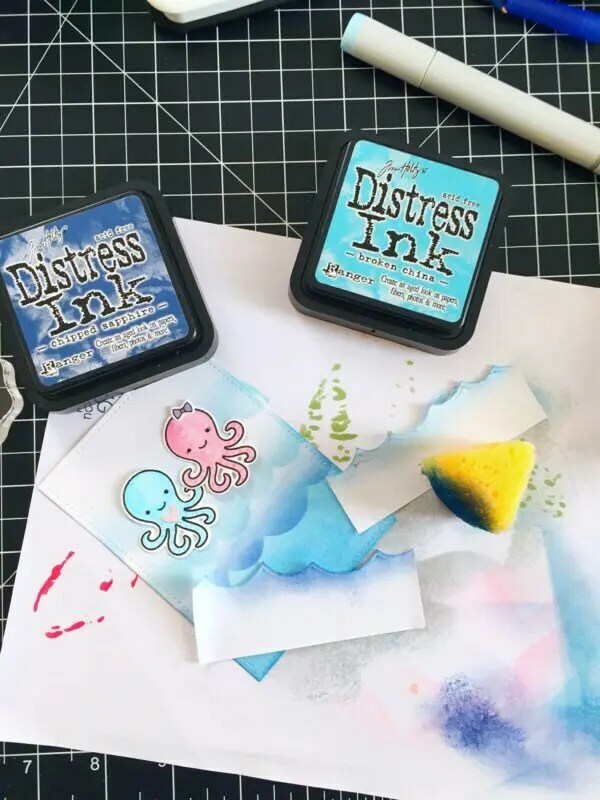 I stamped my images on Neenah solar white card stock and colored my Octopi with my Copic markers. I also stamped the coral images from an older Lawn Fawn Mermaid For You stamp set. I die-cut the images using the coordinating dies. 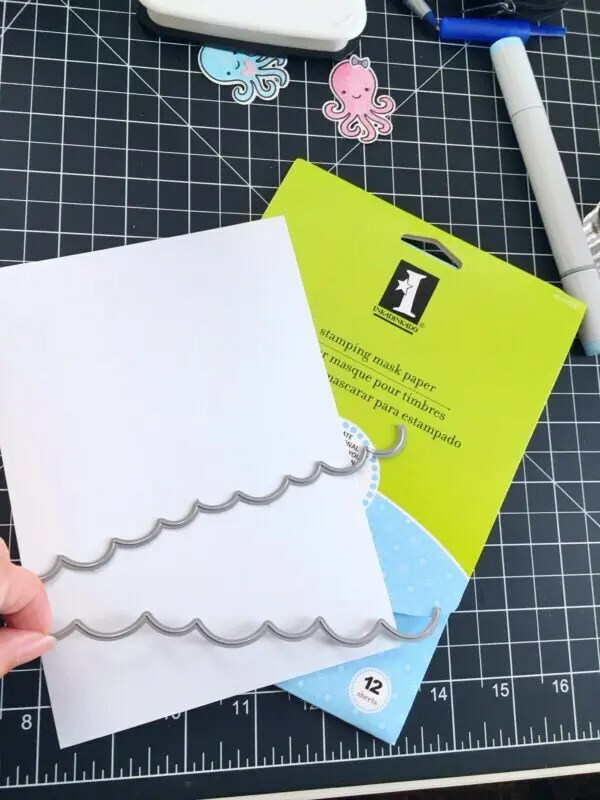 I wanted to color my card stock using the stitched wave border dies to create some waves, so I used the Inkadinkado Masking paper to cut out my mask. I used my distress inks to color the background. I splattered some water using my watercolor brush to create “bubbles”. Somehow it didn’t look like I had enough bubbles so I used my Copic White Opaque paint and splattered some white paint all over my background. This made it look more realistic! I finished off the design of the card by using some beautiful sequin mixes from Kat Scrappiness for my shaker element. I used 6mm Metallic Grape, 6mm Sparkling Snow Sequin Mix, White Diamond Sequin Mix and some green seed beads I had from my stash. I hope you got inspired today. Thank you so much for stopping by. Have an amazing day!